We welcome you on Charles XI Parish in Tallinn website!The first information about the chapel on Tõnismägi, dedicated to St. Anthony, can be dated back to the 14th century. Presumably a chapel and the surrounding cemetery were used by the non-German population of Toompea. Historically Toompea Kaarli Congregation can be referred back to the 1700s. In 1670 the king of Sweden Charles XI ordered the building of a wooden church in a Greek cross style which was deemed for the use of Estonians as well as Finns. In honour of the Swedish King, Kaarli Church was consecrated on the 4th Advent of 1670. Before the invasion of Russian troops in August 1710 many of the buildings surrounding the city fortification wall were burnt down including Kaarli Church. The destruction of the church diminished the parish life within a couple of decades; some of the members joined either Pühavaimu (Holy Spirit) Church, Jõelähtme or Keila congregations.Kaarli church and congregation was being discussed again in the middle of the 1800s, with the thought of the need to build a larger church for the use of Estonians. 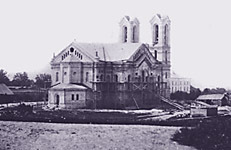 The collection of money for this purpose began at the end of 1850s.The corner stone of Tallinns largest place of worship – Kaarli Church – was placed on October 18, 1862. The architect for the project was Otto Pius Hippius from St. Petersburg, who had many connections with Estonia. Meanwhile, the congregation was re-established, having used temporary church quarters, which became useless and were destroyed after the new church was built. The first church service was held on December 20, 1870, exactly 200 years after the consecration of the first church. However, the church was not completely finished, missing were the steeples and the altar painting and to this day the proposed figures in the wall niches in the project are still missing. In 1870, two possible variations were presented. The first consisted of four men of which three were tightly connected with St. Petersburg; of these was Doctor Philipp Karell who monetarily supported the building of the church and who was one of the first Estonian doctors who in the years of 1849-79 was a personal doctor to the Russian Tsar; and also professors from St. Petersburg Rudolph von Bernhardt and Otto Pius Hippius, the former being constructor of the roof and the latter being the church architect. Into the group also belonged the Elder of the Toompea Guild Hans Heinrich Falck who donated the property and the building stones. The second group of four consisted of the king of Sweden Gustavus II (reigned 1611-1632); a great theologian Martin Luther, emperor of Russia Alexander II (reigned 1855-1881) who in 1864 gifted the congregation with the Komandandi Maja (Commanders House) along with a large orchard and Kiek in de Kök tower, and an Estonian theologian. In 1994, the Estonian sculptor Tauno Kangro prepared sketches of the four evangelists, which were never installed. Out of all the Estonian sacred buildings in the 1800s, Kaarli Church is the most magnificent – not only for its seating capacity (1500 seats) but also architecturally. Built in the historically neo-Roman style, of hewn limestone blocks, on the basic plan of a Latin cross. Following the pattern of Western European cathedrals, the churchs western facade is designed with two tall steeples and with a rose window placed above the main entrance. Since the choir ends in a polygonal apse that is surrounded by a complex in a style of chapel wreath, the sides are characterized with arched windows. The church architecture is influenced by the interior – the space being exceptionally large and open. This is supported by the special arch supporting system, brick supported wood ceiling, which has allowed such a large room to be covered without any support (solution in co-operation with architect R. von Bernhardt). A large part of the church interior – the pulpit, pews, organ loft, etc – is constructed according to O. P. Hippius drawings. The church surface area is 1197.3 m2, space is 33 889.77 m3, interior height 20 meters, steeple height up to the crosses 59.2 meters. The most valuable item is altar mural painting depicting the calling Christ: Come to me, all you who are weary and burdened, and I will give you rest. (NIV – Matthew 11:28), which according to the Byzantine churches, is placed in the apse. This first Estonian fresco was painted by the Estonian artist Johann Köler, which he completed in 10 days on July 23, 1879, according to the Julian calendar. The oldest parts of Kaarli Church are the tower bells of which the north tower bell, casted in Stockholm, was gifted by the king of Sweden Charles XI in 1696. This is the only remainder of the first Kaarli Congregations church, which was destroyed during the Great Northern War. Placed in the southern tower, is a cast iron bell made in Bochum and donated in 1870 by businessman I. E. Steinberg.1882 – completion of the tower building according to F. Sablers project. 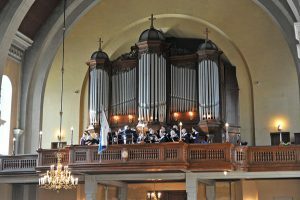 1884 – a 30 stop mechanically tractured organ was completed, which was built by Gustav Norman, the first Estonian organ builder from Lääne-Virumaa. The organ was later replaced. 1889 – lower triple altar painting by Baltic-German artist Sally von Kügelgen, depicting the salvation history: Nativity, The Last Supper and People Mourning For Jesus was finished.1909 – a clock was placed into the rose window above the main entrance. It was purchased from the Weule firm in Germany.1924 – a new organ from the world famous E. F. Walker & Co in Ludwigsburg. The new organ is Estonias largest – 3 manuals and a pedal, 81 stops and 3 transmission stops. Exceptionally powerful is Estonias only 32 pedal string register whose lowest sound reaches the edge of hearing (16 vibrations per second).Kaarli Congregation by numbers of members is the largest in Estonia.All dates before February 1, 1918 are given according to the old Julian Calendar. To calculate the dates in Gregorian Calendar one has to add 11 days to the 1700s and 12 days to the 1800s.